Our NickyBear! How we love you so very very much our little man. Even your big Brother just loves to play and hang with you. We are so blessed for how well he has been doing through this cycle of chemo, We finish our cycle 4 tomorrow morning and start cycle 5 Saturday night. I can't believe how quickly this part of treatment has gone. He has been in such a great mood and he is such a great baby! His ANC is 2200 and his hbg (red Blood) 11.8 and platelets 175. Our biggest problem is how much we spoil him. We just can't help it! So he sure throws a fit when he isn't getting exactly what he wants. Since his counts were up this week, we were able to attend church at Brightmoor. It was about the power of an invite and our pastor asked if he could use our story in his service. 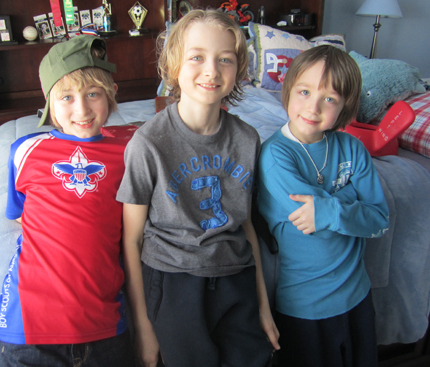 Our son Christian went to school with 2 amazing little boys and they became best friends. Through them I met their mother Cheryl Helm. Cheryl had Christian for a sleepover and asked if she could take him to church, I ended up coming with her that day. Little did I know that that invite would eventually lead to me inviting my brother and Nick. We all were getting our priorities straight and letting God heal us. Then my Dad started attending Brightmoor also. Soon others came and my little brother met his now wife there also .... all from one invite. Sadly, Cherly had became very sick in 2007 with cancer and she was one of the best moms I have ever known. She was hands on and her sons were her whole world. When she became sick I promised to pick her boys up for swim lessons or soccer. I knew she was really ill when she bought me car seats, if you knew her you knew she never wanted anyone to drive her children but her. My heart broke, I remember I started video taping everything the boys did so that when they went home I would leave a dvd for Cheryl for her to watch them and see them since she was too weak to come. I knew how much that hurt her missing out on those moments so I tried to bring them to her. For as long as I live, I will never forget bringing the boys home one day from a play date to her. She was weak and so very fragile and she walked out to her garage to let me bring the boys in. Bryce was asleep in my arms when I carried him into her house and she stopped m e and said, "I don't know what I am going to do if something happens to me.... My mom is too weak, she's older now and my sister is just getting married and couldn't handle it .... I wouldn't let her she said. She looked at me as if I should have an answer to her so deseperate question that her heart planted in mine. A phone rang and stopped us from talking but I vividly remember this day and can replay it as if she was asking me to help her. She flew to New York where they successfully removed the cancer from her liver, however during healing she caught a blood virus that took her life within 24 hours. I remember attending her funeral - devastated, wondering why God took her when these 2 precious little boys needed their Momma. I don't know why, but her work here was complete. After she passed, I wrote her mother and told her about this conversation and unaware of Gods plans for my life .... I did not know the future held having a baby that would soon be diagnosed with cancer, I told Cheryls Mom in a letter, I just was there to help or be extra hands or take them as much as she needed, I told her I didn't know what the future held but my heart loved the boys and I would be there if she would let me be. She never took my offer and a year later I was pregnant with Baby Nicholas.Crazy enough Tuesday we had a knock at the door ----- it was our (other) boys ..... Cheryls boys .... it was timing by Gods hands .... boy how they have grown ... they all look like brothers .... when I took them anywhere people always thought they were brothers ... 8,9,10 all a year apart. 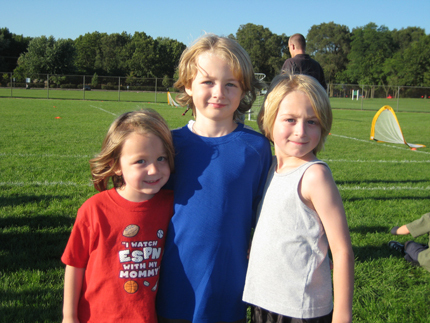 This is a pic of yesterday .... and the one below is from 2007 at soccer when the boys were my buddies, boy I love them .... how we all miss them and Cheryl so much....she made me a better mother and I will always be grateful for my friendship with her. 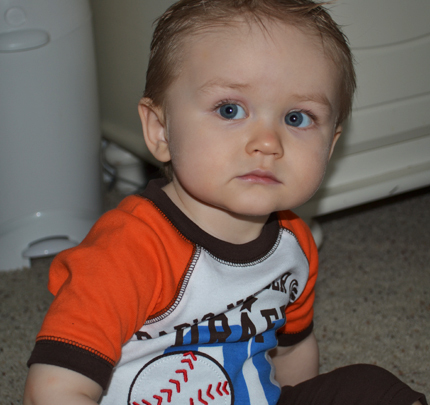 We have his monthly infusion at Rose Cancer Center tomorrow and labs. 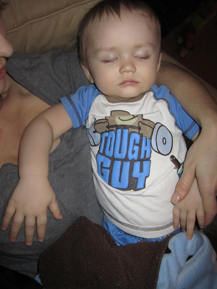 He is our Tough Guy, but mostly he's just my precious lilttle boy that I adore and would do ANYTHING for. How I wish I could take the bullet for every needle poke, MRI, surgery,test and every drug that he must take. I would do it all for you if I could my precious boy. This update was paused from this morning and today I now have to go back to the same hospital and cancer center attached to what housed in the last 3 days a story that weighs heavy on my heart tonight ...... those of you that read updates know there is a family from Detroit that is at St Jude (Luca P. under our protocol friends) , we met while we were there last check-up ..... today this is what they posted on their update ... mind you I met both the writer whom gave birth to a new baby last week and her sister and brother-in-law ready for their new child ....please pray for this family. It is with a heavy, bleeding heart that I post that Baby Andrea Luca Loria has passed away. He is an Angel for his parents, my sister Rosalee and brother-in-law Angelo. He will also be looking after his Big Cousin Luca. He was loved from inception. Rosalee and Angelo were able to love and hold him, even if it was for a short time. He will never be forgotten. Andrea will be the “Little Engine That Could” for his parents. Even in difficult times, he will remind them to “never give up”. May God be merciful on Rosalee and Angelo and grant them many healthy children that their Big Brother Andrea will look after. Please pray that they feel they are not alone in this. Let them feel they are loved and may their hearts heal. Andrea is Paul and my special Godchild that will bring countless blessings for our whole family.